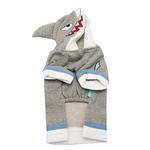 This dog hoodie with shark design is perfect for Halloween or even everyday wear! The Shark Dog Hoodie by Dogo is a pull-over style sweatshirt that will have every one talking! This hoodie for dogs includes a high-cut, stay-dry belly and leash hole for convenience. You can snap back the hood if your pup isn't wearing it! Makes a fun everyday hoodie in cool weather or a fun dog costume! SharkDog Hoodie by Dogo Customer Photos - Send us your photo! Chimorkie Piper is unsure if SHE'S the shark or being EATEN by the shark! Muffy loves this even if she can't see where she is going. Henry is currently 10 months old. When he was teething my husband called him his "little shark". Not only is this sweatshirt so freakin cute it makes us laugh remembering that puppy stage. Jimmy Chews is a 5yo chocolate and white cocker - living in Colorado, he needs a sweater to stay warm. 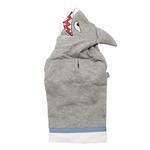 This SharkDog Hoodie by Dogo is perfect for today! Brody knows well over 100 tricks and has earned his Trick Dog Champion Title. Brody is ham and just loves to pose for the camera. Machete is the studliest Mexican shark you could find on the island of Hawaii. Best shirt ever....vino looks great on our boat, our land shark ! He was a rescue dog now he is a king ! A Shark in the park! I love all my hoodies but my Shark one is my favorite!!!! Fits great & is cute w/nice colors! Posted On 11/27/15 by Megan from , Yes, Megan recommends this product! This hoodie was a bit of a splurge, but so worth it! We lived near the beach for a while and everyone got such a kick out of it!! The Small fits my 5 lb yorkie well with some wiggle room and I love how long the hoodie is, too! Posted On 07/06/15 by the mumma from somerville, MA Yes, the mumma recommends this product! This sweatshirt fit my 20 pound pug perfectly. He has scared so many people because they thought he was a real shark. Posted On 06/12/15 by Jessica S from Richboro, PA Yes, Jessica S recommends this product! Posted On 11/26/14 by Maria D from Saint Louis, MO Yes, Maria D recommends this product! Posted On 10/08/14 by Andrea T from , PA Yes, Andrea T recommends this product! Bought this hoodie for our Little Guy. Love the hoodie, and he looks so freakin cute in it! Also love that the underneath is high cut so it doesn't get wet when he pees. He is a Jug (Jack Russell/Pug) currently 17lbs. Ordered a Medium and it fits if not a little snug. Fingers crossed it doesn't shrink when washed. Plan on washing in cold/gentle and air drying. Customer Service chat room was extremely helpful. She was very polite and quick to find exactly what I needed.